Milt Sparks Versa Max 2 for the H&K P30, right hand, black with 1 1/2" belt loops. I ordered my VMII for P30 about 2 months ago and started using it right away! I fell in love almost instantly! I'm not a big guy by any means but I am able to carry a P30 concealed with most of my shirts. Needless to say I am very impressed! Thank you TGS And Milt Sparks! I have always been a fan of Milt Sparks holsters. The craftsmanship is unbelievable, as is the quality of the leather. These are holsters made to distribute the weight of stout guns. I ordered one a VM2 for an HK P30 around noon. I about fell over when I received an email that it had shipped at about 2pm that afternoon and I assumed that the email was sent in error. In short, it was not. I had the holster a couple days later and I simply couldn't be happier with the experience of ordering from Top Gun Supply. 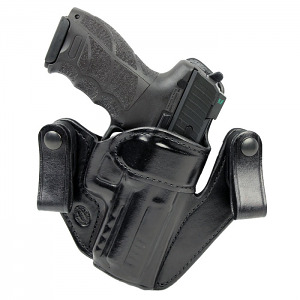 The Milt Sparks VM2 is an excellent holster, and waiting lists are long. Top Gun has them in stock, with fast shipping. I ordered it on the 16th, and received it on the 19th.